Instructors at hundreds of colleges and universities have turned to How to Write Anything for support that empowers every student with advice they need, when they need it. 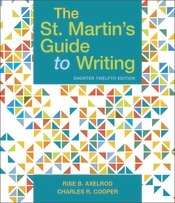 And students love it—holding onto the book for other classes —because the authors’ tone makes writing in any genre approachable, with a flexible, rhetorical framework for the most commonly taught academic and public genres.The fourth edition offers students a new Part 1: Strategies for College Writing, even more support for understanding genres and purpose, and an expanded and thoroughly revised take on grammar, mechanics, and usage—all essential to academic success. 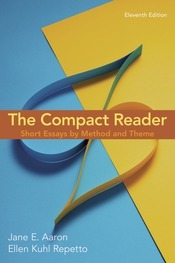 The result is everything you need to teach composition in a flexible and highly visual guide, reference, handbook, and reader.Also available: LaunchPad, an online course space with pre-built units featuring the full e-book, book-specific reading comprehension quizzes, adaptive LearningCurve activities to help students hone their understanding of reading and writing, and additional support in A Student’s Companion to How to Write Anything. 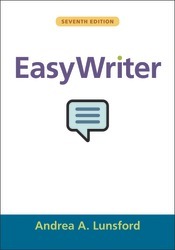 When your students need reliable, easy-to-find writing advice for college and beyond, EasyWriter gives them what they need in a format that’s easy to afford. 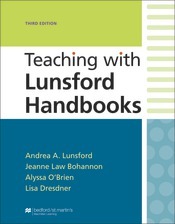 Andrea Lunsford meets students where they are with friendly advice, research-based tips for solving the Top Twenty writing problems, and an emphasis on making effective rhetorical choices. 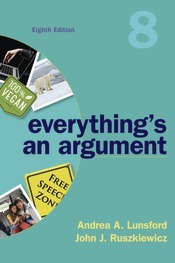 The seventh edition puts even more emphasis on empowering students to become critical thinkers and ethical communicators with new advice about fact checking and evaluating sources and more advice about choosing language that builds common ground. 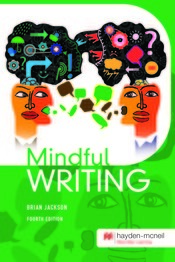 In addition, the seventh edition offers more support for writing in a variety of disciplines and genres and more models of student writing to help students make effective choices in any context. 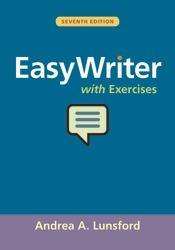 EasyWriter can be packaged at a significant discount with LaunchPad Solo for Lunsford Handbooks, which includes dozens of additional writing models as well as exercises, LearningCurve adaptive quizzing, videos, and podcasts. Offering comprehensive coverage in a hip little package, In Conversation: A Writer’s Guidebook is a pocket-sized guidebook designed for the Instagram generation. 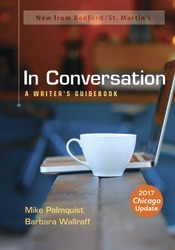 Composition scholar Mike Palmquist of Colorado State University and professional writer and editor Barbara Wallraff, formerly of The Atlantic, develop the approachable metaphor of writing as a conversation for an unintimidating entry point into college-level writing and thinking. 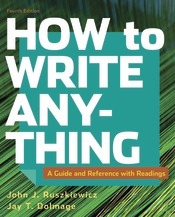 As its subtitle suggests, In Conversation blends the helpful support of a writing guide with the easy-to-use reference framework of a handbook. 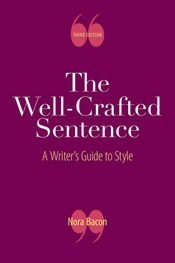 Rather than presenting writing as a set of rigid rules to be mastered, the authors share writerly advice and help students understand the effects of their rhetorical choices. 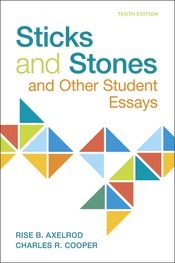 Fresh example sentences in the grammar, punctuation, and style sections illustrate creative revisions, and thorough documentation chapters on MLA, APA, Chicago, and CSE provide dozens of citation models across disciplines. 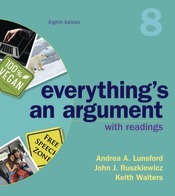 Distinguished by spectacular visuals, natural, friendly explanations, and an emphasis on real-world genres, this guidebook invites your students to be a part of the conversation. 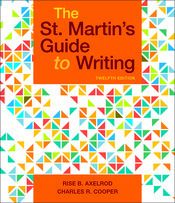 Whether you have years of teaching experience or are new to the classroom, you and your students can count on The St. Martin’s Guide to Writing to provide the thoroughly class-tested support you need for first-year composition, with a rhetoric, an array of engaging readings, a research manual, and a handbook, all in a single book — and available online in LaunchPad. 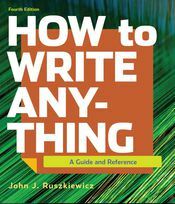 Thousands of instructors and their students rely on the Guide’s proven approach because it works: Acclaimed step-by-step reading and writing guides to 9 different genres offer sure-fire invention that get students started and revision strategies that help them develop their writing. 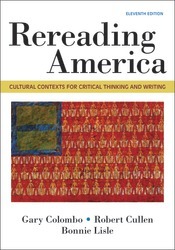 The new edition continues in its strategies to serve a diverse audience of schools and students with an improved, accessible design, new support for reflection that encourages the transfer, and a new Student’s Companion for students taking co-requisite or ALP courses.